I’ve been meaning to write a post for a couple of weeks detailing the state of play of my current analytical projects but I’ve been awfully busy helping my MSc student get the last of her LC-MS data on cherry anthocyanins and phenolics. We managed it in the end and she has a lovely result so I spent last week broadening my focus again and picking up some of the projects I’d had to put aside. Most of last week I also spent trying to derivatise reducing sugars for a collaboration with some lovely people from the Human Potential Centre at AUT’s Millenium Institute. This is a really exciting capability as sugars are notoriously hard targets to analyse chromatographically. 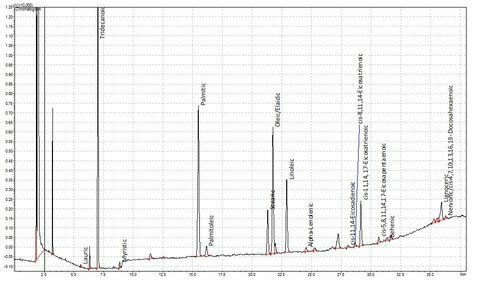 We currently use a gas chromatographic method which involves a quite lengthy and fiddly acetylation procedure but I’ve found a compound that works really nicely for liquid chromatography with a relatively simple derivatisation procedure. There’s also lots of potential to push the analysis into larger oligosaccharides and glycans, with at least two exciting projects already on the table. I’m hoping this might result in two publications, the first being method development and the second an application. I’ve also started developing a quantitative method for bile acids and have been approached to quantify lignin-derived phenolic compounds in sediment and plant material from estuarine habitats across the South Pacific. Very exotic! At some point I’d like to get some more method development done on neonicotinoid pesticides as I’ve developed a very cool and powerful extraction method which may solve the recovery and sensitivity problems. Again, definite options to present this as a method development and validation paper so no details yet. The tower mounted on top is the AOC-20i autoinjector. We also have another two GC-210s with autoinjectors and a pair of venerable GC-17As. 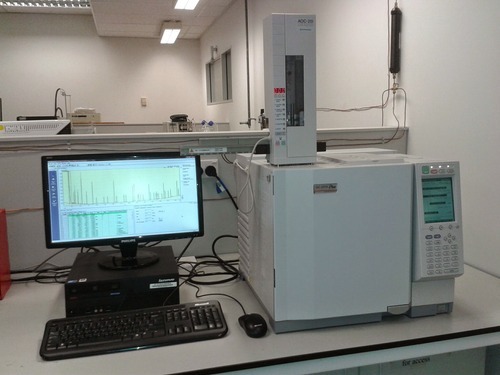 These instruments are used for quantitative analysis of small biomolecules such as fatty acids, amino acids and sugars in organisms, biofluids and food products as well as for profiling the volatile compounds associated with food flavours by Solid Phase Micro Extraction [SPME]. 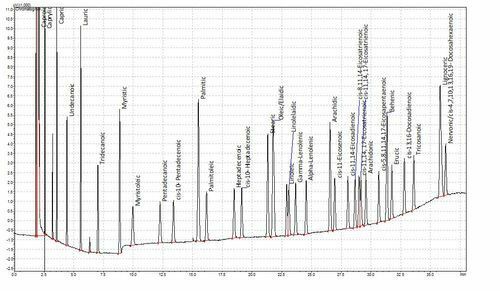 We have a wide range of columns to choose from but two phases that seem to separate most analytes are 5% phenyl, such as Zebron ZB-5, for less polar compounds and wax columns, such as the Zebron DB-WAX, for more polar things. 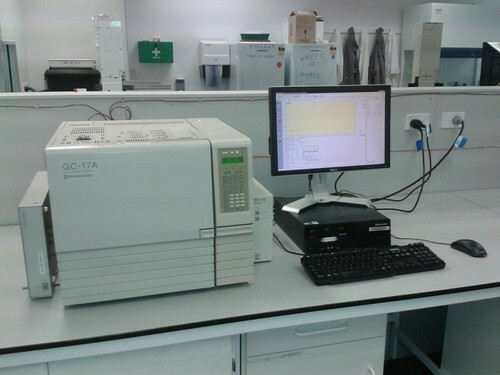 The GC-2010 Plus is fitted with a Restek FAMEWAX column for Fatty Acid Methyl Ester [FAME] analysis and is routinely used to separate and quantify 36 different FAMEs. Fatty acids are not volatile in the GC and so cannot be analysed natively. A while ago though, some clever chaps realised that you could esterify fatty acids to make them volatile. This is hugely advantageous as fatty acids are not especially amenable to liquid chromatography either. This method has been refined over the years and we now use a one-tube esterification and extraction method based on de La Cruz Garcia et al (2000). The plots below show a chromatogram of a Supelco FAME standard and below that the FAMEs from a sample of human plasma. Tridecanoic acid is the internal standard.